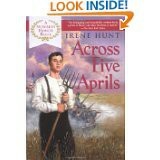 The unforgettable story of young Jethro Creighton who comes of age during the turbulent years of the Civil War. Written by Irene Hunt. Softcover 190 pages. Newberry Medal Honor book. Grades 6 and up.